HORROR EXPRESS was not actually a Hammer Film but it may seem like one, thanks to its stars -- Peter Cushing and Christopher Lee, two stalwarts of the Hammer stable -- and subject matter, the latter of which spans space aliens, body hopping, bloody horror and zombies run amok. 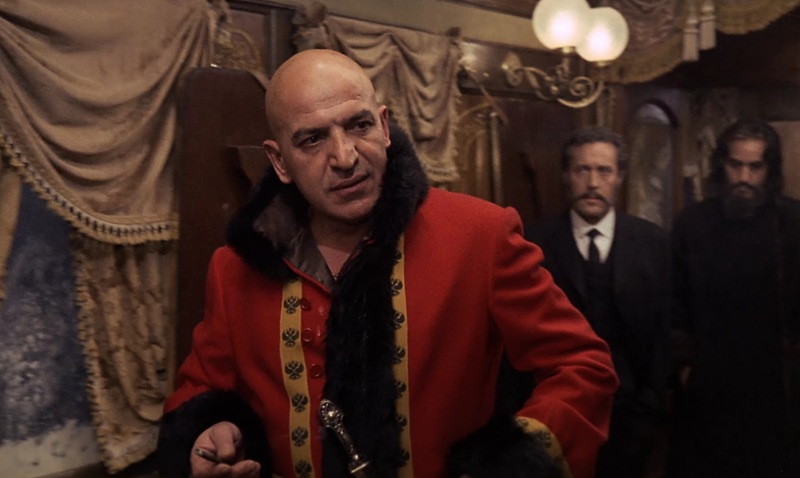 As written by Arnaud d'Usseau and Julian Zimet and directed by Spanish filmmaker Eugenio Martín (working here under the more American sounding name of Gene Martin), this 1972 movie is an oddball precursor to everything from The Hidden to The Walking Dead. 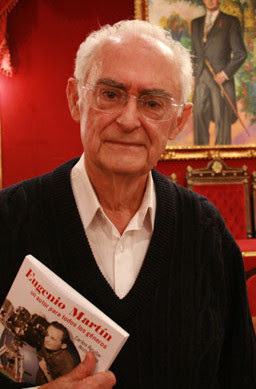 Senor Martín, shown at right in his twilight years, did a workmanlike job of bringing all this together, while the decent enough acting from the leads and support, plus a very nice "period" look to the sets and costumes, combine to make the movie an enjoyable enough romp for those inclined to this genre. 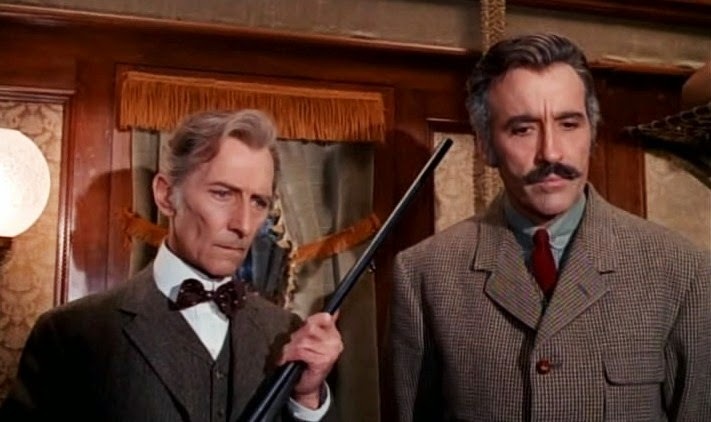 The movie begins in Manchuria (or maybe points east) as Lee, playing one of his typical stern-faced scientists, discovers an ancient body encased in ice and then loads it onto the titular train (the original Spanish title of the film was Panic on the Transiberian Express). Very soon, one train passenger after another is dying via bloody eyeballs and a very fast and thorough "brain wiping." OK: By this point in time, we've seen it all before (or since), yet for fans of the horror/sci-fi/thriller genre, Horror Express offers enough decent delectation to pass muster. Cushing and Lee (above, left and right respectively) are solid fun, as usual, while the best supporting performance comes from Alberto de Mendoza (below) as a priest who is just as happy to serve Satan as God, so long as his master is really powerful. In the final third, no less than Telly Savalas (below) makes his usual "bold" appearance, rather tossing a monkey wrench into things with his over-the-top style. 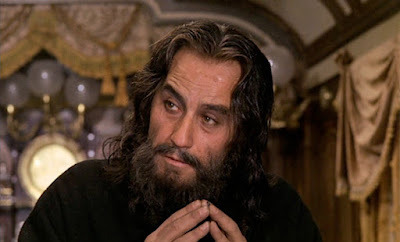 But by then the movie itself has gone over the top, with even more soon to come. So just settle back for a wild ride. And, for heaven's sake, don't look into that naughty monster's eyes! 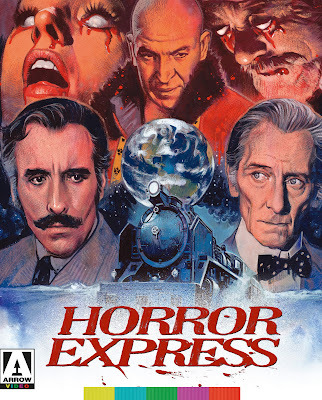 From Arrow Video via MVD Visual, and running 88 minutes, Horror Express leaves the station tomorrow, Tuesday, February 12, on Blu-ray -- for purchase and (one hopes) rental. As usual with Arrow, there are bonus features aplenty. Click here to view all that you'll get in this particular package.